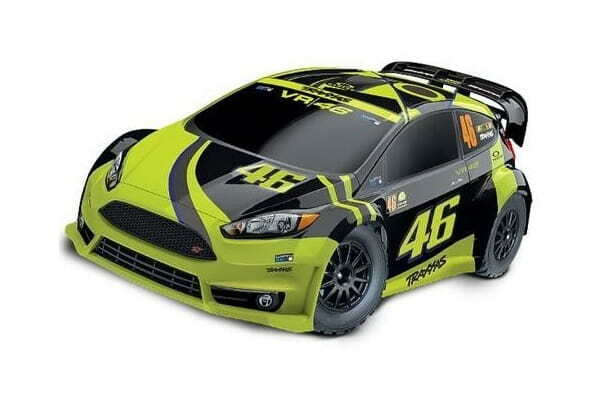 Traxxas Rally Ford Fiesta ST Electric Rally racer TQ 2.4 VR46 Rossi Edition. To be competitive, rally cars must offer blistering performance on pavement, dirt-roosting speed off-road, a trick suspension, and 4WD to put the power down. The Traxxas VR46 Ford Fiesta ST puts you in the driver’s seat for intense all-surface rally action! The VR46 Fiesta ST is specially tuned with a low center of gravity (Low-CG) chassis and oil-filled Ultra ShocksTM to be agile on the track. When the pavement ends, its full-time 4WD, long-travel suspension, and rally-bred tires dig in for ultra-fast bumper-to-bumper racing action. The powerful Titan® 550 motor muscles you to the front of the pack and waterproof electronics allow authentic all-weather racing. The Traxxas VR46 Ford Fiesta ST is Ready-To-Race®, and built Traxxas-Tough for versatile, exciting driving fun that could only come from Traxxas. Valentino Rossi, known by fans as "The Doctor", is one of the most accomplished motorcycle racers in the history of the sport. With nine world championships, Rossi's #46 livery is known around the world to motorsports fans and he is recognized as a superstar on and off the track. As a sponsor of Rossi's Monza Rally car, Traxxas is excited to introduce a new special edition VR46 Ford Fiesta ST Rally.